Dear business friends, ladies and gentlemen. Thank you for your trust and support. 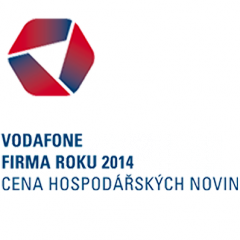 We decided to compete in the ninth year competition - The Company of the Year 2014 by Vodafone, announced by the daily newspaper Hospodarske noviny Czech Republic. Competition is one of its branch and regional intervention at the largest business competitive contest in Czech Republic. The evaluation reaches a maximum objectivity and creates a completely unique mutual comparison of participants in each region and for the whole Czech Republic.